Connection to the Hunter Valley – Staff Nurse Catherine Thomas was born in Minmi and trained at Maitland Hospital. She is named on Kurri Kurri Congregational Church Memorial and Pelaw Main Public School Memorial Gates. 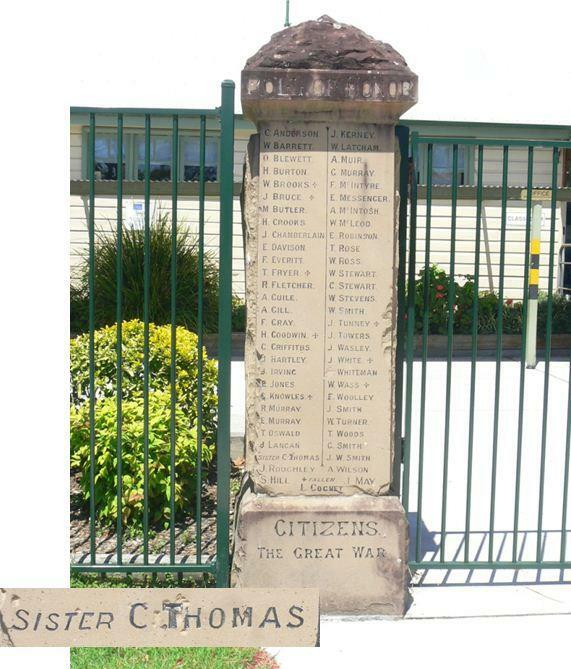 Left side of memorial gates, Pelaw Main Public School, and detail. Catherine’s name appears third from the end in left column. Click on image to enlarge. Service location – Fremantle Quarantine Station. Catherine had been destined for Salonika, but her transport, the Wyreema, was recalled at sea because an armistice had been signed. She disembarked in Western Australia and nursed casualties of the great influenza epidemic. How many Great War nurses were mentioned in dispatches 3 times?